This resistor color code calculator will help you determine the value of axial resistors marked with color bands. It can be used for 3, 4, 5 and 6 band resistors. You can select the colors of the corresponding bands by clicking on them in the table. The resistor will visually show your band color choices and display the value of the resistor above. If the resistance value is part of a standard E-series value, this will be shown in brackets after the resistance value. In the case of 6 band resistors, this calculator assumes the 6th band is used to indicate the thermal coefficient. In some rare cases the 6th band can also indicate the reliability of the resistor. 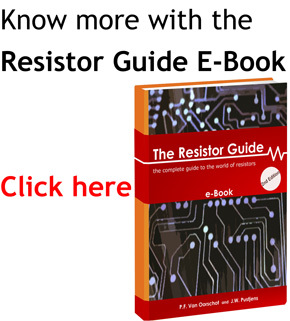 For more information visit the main page on the resistor color code. While we did our best to check all possibilities and remove all bugs we cannot guarantee the calculator always gives the right value. Furthermore there are several exceptions of manufacturers using other colors for specialized applications. If you have to be absolutely sure about the ohmic value of the resistor it is advised to remove the resistor from the circuit and measure the resistance with a multimeter.